Zimbabwe is to issue new banknotes in an effort to tackle the serious cash shortages afflicting the country. From Thursday, notes worth 250,000, 500,000 and 750,000 Zimbabwean dollars will enter circulation. At the same time, the highest value note now in use - the 200,000 dollar bill - will be phased out, despite only being introduced in July. Rampant inflation above 8,000%, mass unemployment and shortages of fuel and basic goods have blighted the economy. Zimbabwe's central bank governor, Gideon Gono, blamed the economic crisis on the country's senior officials. "Our economy has fallen prey to a high level of indiscipline and corruption prevalent in the economy as well as diminished economic patriotism on the part of most people holding positions of authority in our economy and society," he said. President Robert Mugabe and his government normally blames the problems on a Western plot designed to oust him from power. 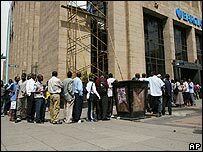 In recent weeks, increasing cash shortages have led people to start sleeping outside banks, while queues outside branches during the day have become a familiar sight. Mr Gono said the new notes would rectify the situation and make cash shortages "a thing of the past". "Within the next few days, there will be sufficient cash to go about our business," he said. Ministers have rejected calls from some businesses to introduce lower value notes which they say would ease the burden on shoppers who currently have to carry bundles of cash even to make basic purchases. Zimbabwe already has the highest level of inflation in the world. The 200,000 dollar bill, which Mr Gono said was being widely used on the black market, is worth about $6.66. From now on, government officials will monitor cash withdrawals at banks while individuals will be limited to 50m dollars in deposits. Critics of President Mugabe accuse him of allowing the economy to go to ruin but he has remained defiant, banning all pay and price rises last month in an effort to stabilise the situation.